The following text is an article by the blogger named Killtown where he argues that on September 11, 2001 the Pentagon was attacked by something other than a Boeing 757 jetliner originally flying as AA Flight 77. I have not studied and analyzed the events at the Pentagon sufficiently to have an opinion as to what happened there, though, as I said already, many things about the official version of the events at the Pentagon seems far fetched and makes little sense. It is for one difficult to see how an amatuer pilot such as Hani Hanjour could have pulled off the near-impossible manuever required to hit the Pentagon flying with his engines a mere two feet off the ground. Even if Killtown is wrong and the official version - or some variation there of - is closer to the truth somebody still has lots of explaining to do on a number of issues, such as why Flight 77 was never intercepted, let alone shot down, or why not one of those officials whose job it was to protect the Pentagon has been relieved of their duties. This article is presented for informational purposes only. At this point I neither endorse it, nor dispute it. I find it informationally valuable. I would also like to note that no matter what happened at the Pentagon the case can still be made that the official story of the 9/11 is little more than a coverup of the true story, thus making some elements of the US government complicit in at least the coverup of a large-scale crime. And that is, at a minimum, obstruction of justice. "Why would the government hijack a 3rd plane, Flight 77, but not crash it into the Pentagon when they took the trouble to hijack two other planes and crash them into the WTC?" "Why would they want to crash a plane into their own defense headquarters?" What do you think would be the easiest part of the Pentagon to hit, the huge rooftop that looks like a giant "bull’s-eye" from the sky, or the side of the Pentagon that is only about seven stories tall? I’d say the roof. But what if you had to hit the side of the building that is not even 2x taller than a Boeing 757 and not only that, but a certain side, certain section, and certain floor of that side? The government conspirators needed to hit the exact section of the Pentagon that was hit and they needed to hit it low to the ground. A Boeing 757, even flown via remote control or computer guidance, would have been too risky for them to use because it is too big and cumbersome to chance its accuracy, especially having to fly what they wanted to hit there super fast so most witnesses on the ground wouldn't be able to see what exactly it was, and a plane that size could cause more damage than they wanted too. They needed to use something very accurate to hit the ground floors of that small section of their building, like a missile or UAV, that also wouldn't cause too much damage to the Pentagon, or hit the ground. Can you imaging them trusting an empty remote controlled 115 ton Boeing to perfectly hit that small section low to the ground without overshooting high and flying over the low sitting Pentagon, or without bouncing off the lawn and breaking apart to expose that no passengers where on board and sending large pieces of the plane in who knows which direction? They had to use something much smaller and accurate that would be able to hit low to the ground without hitting the ground. If they made it looked like it had dive-bombed into the roof, or flew straight into the uppers floors, they wouldn't have been able to have faked this plane crash because they wouldn't have been able to have easily manufactured a somewhat realistically sized and shaped hole in the roof, or upper floors to make most people think a 757 could have made as compared to floors near the ground and they needed to have the section they hit collapse so it would help cover up the oddly shaped hole they manufactured for the crash and to help cover up the fact that no 757 crashed there. 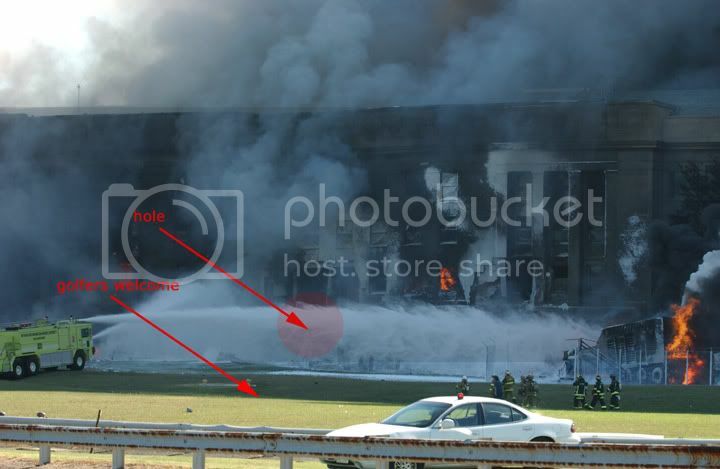 So that is why the crash happened directly into the first floor and why it didn’t hit the lawn, or destroy any of the cable spools out in front, why no mark was left on the 3rd story wall where a 757's tail should have hit, why there wasn't as much damage to the Pentagon as one would think a mostly fueled 757 would cause, why the oddly shaped hole looked like the plane had flown in level instead of it hitting with it's wings banking to the left as we were told, and why this aircraft made experienced air traffic controllers monitoring it think it was a "military plane" from it spiraling down and around the Pentagon dropping the last 7,000 feet in two-and-a-half minutes to specifically hit that side and 1st floor of that section instead of taking the more easier route of dive-boming it straight down into the roof after it flew over the White House area, and why the first reports of what crashed there was a helicopter. I really doubt Hani Hanjour could fly a 115 ton Boeing 757 like an agile jetfighter when there is no evidence he ever flew a 757 before in real life or in simulation, when one of his flight instructors said he could not fly at all and that they questioned whether his pilot's license was genuine, and when his skills were so bad that he was refused to rent a Cessna the month before the attack. It should be self evident enough that the section of the Pentagon hit was hit on purpose. The section hit was the only section in the entire Pentagon that was being retrofitted and it was being retrofitted, of all things, to help bolster it against attack. What are the odds of that? And not only that, but it was hit almost in the middle of that renovated section in which they had just installed a new sprinkler system. Hitting this section lowered the number of potential victims because this section was not yet fully repopulated and a fire truck had just been pulled out from the firehouse that was coincidentally right next the section that was hit. Another coincidence is that side was the only lawn side that didn't have a parking lot or other things built next to it that would have made it much less accessible for the rescue crews to fight the fires and rescue the injured. Another factor that was in the Pentagon's favor was hitting their own building ensured the availability of military doctors, nurses, and first aid responders for all the injured. So think about it, the "Arab terrorists" hit the worst section for them and the best section for the Pentagon. So what was so special for our military to take the added risk of hitting that specific section at their defense headquarters when hitting the WTC would surely be enough to cause a wave of world wide indignation for their master plan? Now I don’t know about you, but if I had to announce a bureaucratic nightmare that I wanted to be buried as quickly as possible from the minds of the American people, what better time to announce it than the day before every American’s mind will be distracted by a most horrible event? Now think about it, less than 24hrs after Secretary of Defence Donald Rumsfeld (who was on the safe side of the Pentagon when it was hit) announces his agency lost track of a mind-blowing $2.3 trillion dollars, the section that housed the people and paper trail that would know where all that money went was blown up in the most bizarre events in America's history. 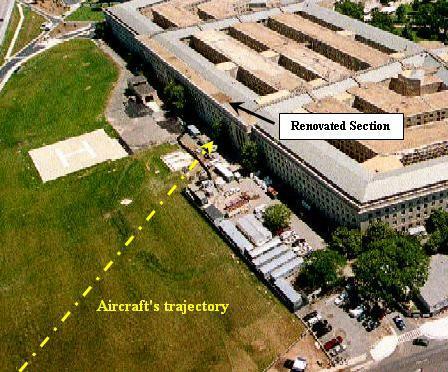 Again, the Pentagon benefitted from this section being hit. What also adds to the interest is the Under Secretary of Defense (Comptroller) and Chief Financial Officer for the Department of Defense who is in charge of all the Pentagon's money was Dov S. Zakheim, who not only is a member of the Council on Foreign Relations as well as an ordained Orthodox Jewish rabbi and some say is a dual Israeli/American citizen, but who is also a member of the PNAC, along with Donald Rumsfeld, and was a contributing author of the PNAC's "Rebuilding America's Defenses" that essentially talked about needing a "new Pearl Harbor" to build up American's military might exactly one year before it happened. Some of Zakheim's former jobs are interesting too. He was vice president of a defense contractor, System Planning Corp., which made remote control and flight termination products and was chief executive officer of SPC International Corp., a subsidiary specializing in political, military and economic consulting. So that is why they hit that section of the Pentagon and why they didn't use a Boeing 757 to do it. See also: Pentagon's Official Claim, Pentagon Crash Motives, Where The Pentagon Was Hit, and Rabbi Steals $2.3 Trillion!